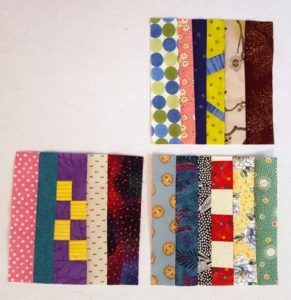 Home » blocks » My String Blocks for Dec.
My String Blocks for Dec.
Posted by Sharon on December 26, 2016 in blocks | Comments Off on My String Blocks for Dec. Sadly, I only got 3 blocks made this month. I was hoping for more, because I really like this idea for the string blocks. But I figured I’d better post what I have! I need to do more of these for me – what a great idea Sophie! Thanks! And thanks for all you do for the Block Lotto every month! I appreciate all your hard work.